Use GNOME Do and its many plugins to extend desktop functionality. Stuck on Firefox? You may find fulfillment in an alternative browser. Make your own reality, virtually. 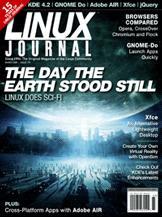 Marcel Gagné's Cooking with Linux The Evolution of the Desktop—How Far from the Pinnacle?